Do you like to hold your pet’s jaw and insert a tablet forcibly? Inserting a tablet into the pet’s mouth may be the last option for every pet parent. All of us know how pets can fuss when it comes to swallow a pill. That moment is when we really come to know how stubborn our pooches can be. It is the most obvious option to hide your pet’s pill into the food so he gobbles it up along with the meal. But, is it easy to fool a dog’s nose? They can smell the tablets from miles away and will skip their food just after a single sniff. Smelling is their strength. We have to beat them by cooking a super smelly, tasty food! We all know that the sense of smell is the strongest part of our poodles. This aspect makes it difficult to dose them with any tablet. So you may have to choose their favorite food to cover up the pill with it. Limburger cheese or cheese rolls with butter can cover up the scent of his pill. If your pet loves to have these things, coat the pill with it to mask the bitter odor. Observe your pet and if he is drooling, then you are on a right track of enticing him. Flavored tablets can make things a lot better! Generally, dogs may need to take pills for arthritis, flea control or behavioral anxieties. Instead of the bitter and repelling tablets, you can choose flavored tablets like Rimadyl (carprofen) and Deramaxx (deracoxib) often prescribed for arthritis. To treat fleas, you can try Bravecto, a pork flavored tablet or beef flavored Nexgard to avoid the tantrums thrown by your poodles. Timing can change the game! Usually pet parents run behind their pawed friends to give them their tablets. Instead, if you choose a perfect timing like a leash walk, when your canine is distracted by the surrounding smells and wouldn’t know what he is swallowing can be ideal to administer his pill. Catch the treat- engage him in his favorite game! It can be a lot better if you entice your pets with homemade treats. Stuff the pill deep into meat balls or cheese balls and play catch with your darling pet. They will get absorbed in the game as well as the taste of your delicious treat and gobble up the tablet inserted piece without even noticing it. Pill covers are available in the market which captures the scent of the pill when it is put inside. Though, they can affect your budget a lot but this option can be advantageous if your furry friend is prescribed with several pills a day. All you have to do is just mask the odor! So, don’t you think these tricky ways of giving pills will be a great help? 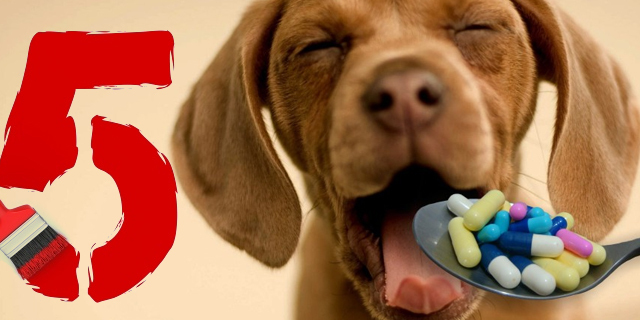 Try these interesting ways to administer tablets and block your pets from vomiting their dose.